Jessica hard at work! There are 3 hygiene rooms. 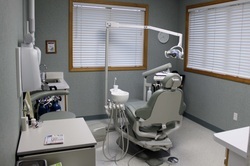 Dr. Duggan's operatory. There are a total of 5 operatories. Every time any child comes into the office, they get to place a sticker next to their name and receive a sugarless sucker.